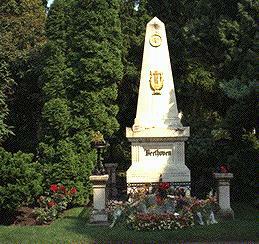 The Zentralfriedhof (Central Cemetery) in Vienna was opened in 1874 and is Vienna's largest burial ground by far. There are 330,000 graves and 2,500,000 people have been buried here during the last 122 years. 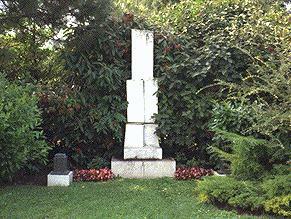 We'll take a look at some of the Ehrengräber now, focusing on the composers who are buried there. It must be noted that many of them were transferred from other cemeteries to the Zentralfriedhof. 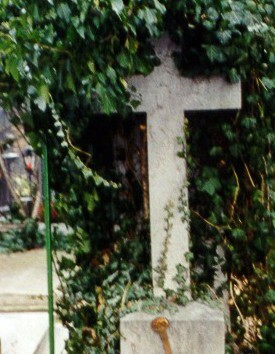 Sometimes their original tombs remain at the original spot which can be quite confusing at times. 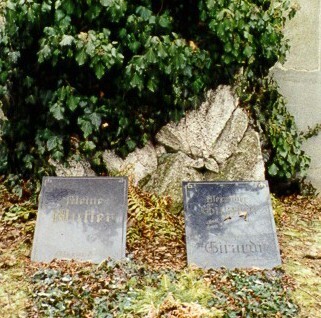 On the left the grave of Johannes Brahms (1833-1897), the German who was introduced to the public by Robert Schumann in 1853. He was famous for his piano concerts and, of course, his compositions. Brahms wasn't lucky in love. His subsequent love for Agathe von Siebold, Julie Schumann (daughter of Robert and Clara) and Elizabeth von Stockhausen didn't result in a marriage and he died a bachelor. Brahms hated cats, by the way. On the right is Franz Schubert (1797-1828), composer of Die Winterreise (1827) and many other works, including twelve opera's, nine symphonies and over 600 songs. This 'genius of melody' probably suffered from syphilis, leading to his early death in 1828. 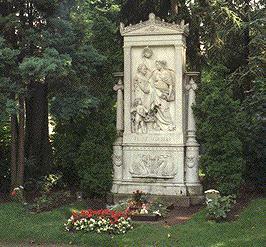 In 1888 his remains were transported from the W&aumlhringer Friedhof to the Zentralfriedhof. Johan Strauss (1825-1899), son of that other Johan Strauss (1804-1849) who composed the Radetzky March (1848), is above on the left. His operetta's were very succesful all over the world and this King of Waltz, who was born and died in Vienna, is the composer of An der schonen blauen Donau (1867) and Eine Nacht in Venedig (1883). On the right is Ludwig von Beethoven (1770-1827), the author of nine symphonies and one opera, apart from numerous other pieces of music. Until 1800 he was mostly famous as a virtuoso of the pianoforte. Ten years later he was no longer famous as a pianist, but regarded as the greatest composer of his time. Beethoven had been more or less obliged to pursue new directions, since from 1800 on he gradually lost his hearing until he became completely deaf in 1815. On the left is the magnificent tomb of Arnold Schönberg (1874-1951). Schönberg originally composed music in his spare time, but after the bank where has was employed went down, he started writing operetta's for a living. Thanks to Strauss he received the Liszt Scholarship and in 1904 he conducted his Pelleas und Melisande. In Vienna his work was little appreciated, so he left for Berlin where he was far more succesful. In 1933 he left Germany and went to the United States. 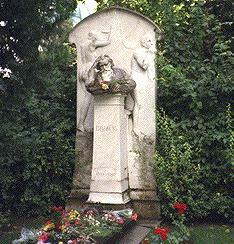 Schönberg's tomb was designed by the sculptor Fritz Wotruba (1907-1975), who was buried himself on the Zentralfriedhof and whose grave is pictured on the right. Wotruba is mostly famous for his Wotruba Kirche (Wotruba Church) in Vienna, which is just as much a fascinating piece of modern sculpture as a church building and looks completely different when viewed from different angles. It was built between 1965 and 1976 and can hold up to 250 people. 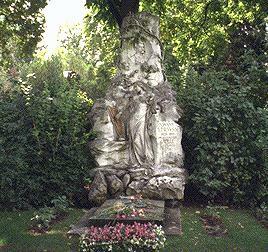 Of course the Zentralfriedhof houses many other more or less famous people with or without an Ehrengrab. Among them are the statesman Dr. Bruno Kreisky (1911-1990, Bundeskanzler 1970-1983), actress Alma Seidler (1899-1977), opera singer Lotte Lehmann (1888-1976) and the beloved comedian Alexander Girardi (1850-1918). 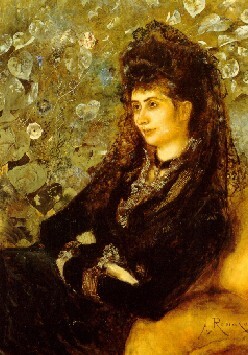 In the 1890's Girardi fell madly in love with the notorious actress Helen Odilon (1865-1939). Their marriage was a disastrous one and Odilon designed a devilish scheme to get rid of Girardi. Using her connections she tried to put him away in a sanatorium. Girardi, however, heard of the plan and left his house secretly. When they came for him they mistook a neighbour for Girardi, since this unfortunate man was dressed in Girardi style, as were many citizens of Vienna in those days. Girardi then went for protection to Katharina Schratt, the famous friend of Kaiser Francis Joseph, and she helped him to escape his dangerous wife. 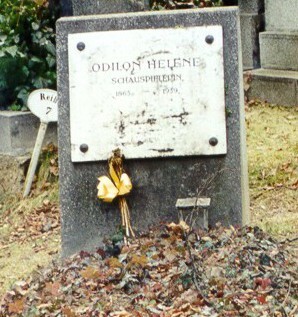 They were soon divorced and Odilon was eventually buried on the Zentralfriedhof as well. She had to settle for an ordinary grave, but fortunately it's still there. Another person hardly known outside Austria these days is Anton Romako (1832-1889). He had his days of fame in Italy but when he returned to Vienna in 1876 the public wasn't exactly waiting to welcome him. Near the end of his life his two youngest daughters tragically comitted suicide. Allthough his work was rediscovered in the second half of the twentieth century the name on his gravestone (below, left) is hard to decipher nowadays. Romako's Portrait of Mathile Stern (1886) (below, right) belongs to the collection of the Österreichische Galerie in the Belvedere in Vienna. A.L. Bacharach (ed. ), Lives of the Great Composers volume II, Penguin Books, Middlesex, 1947. S. Brook (ed. ), Vienna, Eyewitness Travel Guides, Dorling Kindersley, London, 1995. R.S. Budig (ed. 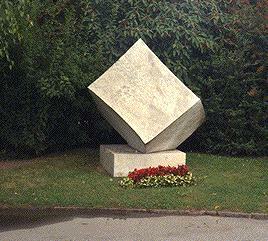 ), Ehrengräber am Wiener Zentralfriedhof, Compress Verlag, Wien, 1995(?). Encyclopedie van de muziek, 1959. G. Markus, Katharina Schratt, Die heimliche Frau des Kaisers, Ullstein, Frankfurt/M, 1988. Anton Romako, Oberes Belvedere, Wien, 1992.